Vada's Blog Stamp Inks and Paper : Born to Stamp. Another card for the Gingersnaps “Once in a Blue Moon” challenge. For some reason, I got it in my head… “Wonder if the labels would stay in place if I embossed them”? Kinda like Cuttlebug Highlights. Needless to say it worked. My stamps are from; Born to Stamp, Limited Edition and coffee cup is from Hero Arts, and Rubber Stamp is from Crafty Secrets. Labels: Gingersnap Creations Challenge, Hero Arts. Love the use of labels and I really like the numbers and colors you used - very cool! Great idea, looks like it worked perfectly! Well done! Fantastic use of labels and awesome idea to emboss them! Thanks for playing the Gingersnap Creations Ginspiration Challenge again! Fantastic use of the stamps and the labels, really awesome. 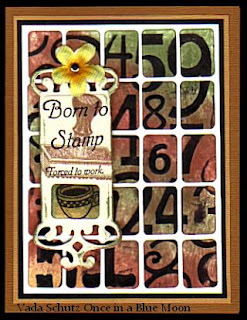 Love this born to stamp card! Have a wonderful New Year Vada! Warm Hugs!